This post starts with being in front of our house at 6:15 am listening to the cacophony of sounds coming from what must have been a rowdy Christmas Day gathering of Sulphur-crested-Cockatoos at end of the street (near the Dickson Drain). While it was amusing to hear all this first thing – my thoughts went out to anyone trying to sleep in. Living in an inner Canberra suburb is something I cherish. Besides the generous greenery, there are also the joys of having a reasonable level of biodiversity. Unfortunately, the fate of Canberra’s biodiversity is an issue that is yet to be seriously dealt within the current ACT Government. Urban biodiversity is fundamental to the survival of the planet, being about the life of the complex systems of animals and plants that we should be doing far more to cherish and ensure they all survive – especially within our urban spaces. From my initial research on the subject of biodiversity in Canberra, it seems that there is the traditional divide and emphasis on what is recognised as being of interest in biodiversity. The areas of interest within the ACT documentation are on the obvious – being the ecosystems within open spaces and woodlands around the city edges and some of the inner spaces such as Gold Creek and Weston Park. What is not identified is the stewardship of the city’s biodiversity that is within the streetscapes and – more importantly – is within everyone’s frontyard, backyard and side garden spaces. Where there is a healthy biodiversity you will find a complexity of insects, birds, and other life. When you look through development applications and planning documents, care of the city’s biodiversity is not a priority. It may be mentioned but it is not protected by the requirements to be met in order for small to large developments to proceed. If there is one thing that should have been learnt from the ten year drought, it is that most of the formerly cherished lawns should largely be replaced by a much more diverse range of plants – that would not only be more drought-resistant (require less water), but also add to the biodiversity of the suburbs. Our older suburbs were originally designed with a reasonable diversity of shrubbery that led to a healthy biodiversity. Sadly with the ad hoc approach and the flexible planning regimes now being applied, much of this is under threat. Campbell is one suburb designed with generous greenery. However, this is slowly being eroded through a planning approach that does not include enhancing, or at least maintaining, the biodiversity of the area. The cherished greenery, both public and private, is under threat. Many of Canberra’s newer suburbs are not based having complex and healthy biodiversity within the residential spaces. This situation may be impossible to turn around given the smaller block/larger house approach by developers – and as approved by our planning directorate. Many have token plants but most will never be able to introduce any form of thick hedges or extensive bushes and trees – there is just no room for such complexity. Ornamental grasses and the occasional flowering plant is not the same. It comes back to planning – again. It is about how we plan and develop our suburbs – or in the case of older suburbs – redevelop them. A greater priority needs to be placed on embedding care for, and the enhancement of the city’s biodiversity within the planning structure. Such an approach does not exclude increasing density of residential houses. But it does mean that a landscape approach to development needs to be upfront rather than being seen as decoration and treated as an optional add-on. We actually have talented professionals within our government bureaucracy and within a few local professional consultancies who, if given the opportunity, could provide the expertise and guidance to turn this situation around. Sadly for too long now, the political will has been missing. Our governments have seen development as the priority and have been advised (by whom I wonder) that increasing biodiversity and undergoing residential development are exclusive of each other. Wrong! The ACT Government is charged with the stewardship of our city’s total environment – and therefore needs to reconsider its role in caring for the landscapes, the various ecosystems and the total biodiversity of the whole city. One wonders why this is not a top priority for the Greens? I will think more on this while sipping a coffee and watching the many birds in our garden. What a horribly misleading comparison those two pictures make. For starters (as Maya123 pointed out), the Gungahlin suburb is new, and the trees haven’t had time to grow to maturity. It will look very different in 20 years. 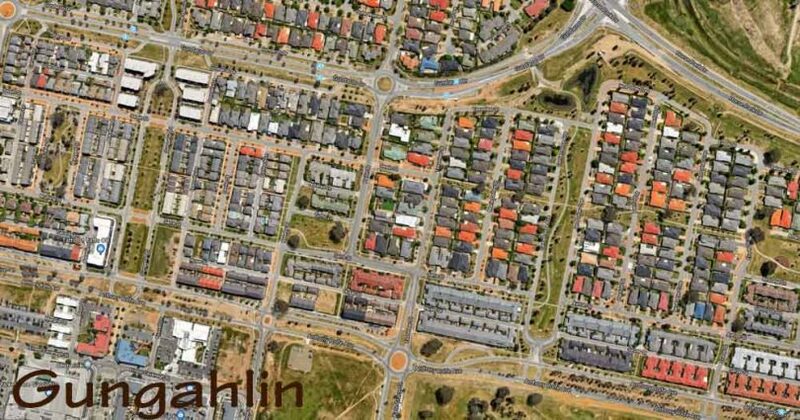 Secondly, the Gungahlin suburb has at least twice as many dwellings, probably closer to triple. To house that many people at Campbell densities would mean you would have to clear two or three times as much native vegetation or farmland. If you did that for the whole city Canberra would be a horrible mess of urban sprawl stretching from Yass to Tharwa. I agree that there needs to be better planning around how redevelopment and subdivision occurs in R1 and R2 zones, but honestly Canberra’s planners are doing pretty well otherwise. I’m a bit tired of people referring to high density that they don’t like as ‘future slums’ or ‘slums in the making’. It’s incredibly elitist and offensive to the people living in these areas. I agree that many of Canberra’s high density developments (and for that matter much of the recently built medium and low density new construction) are poorly designed, constructed and unattractive. 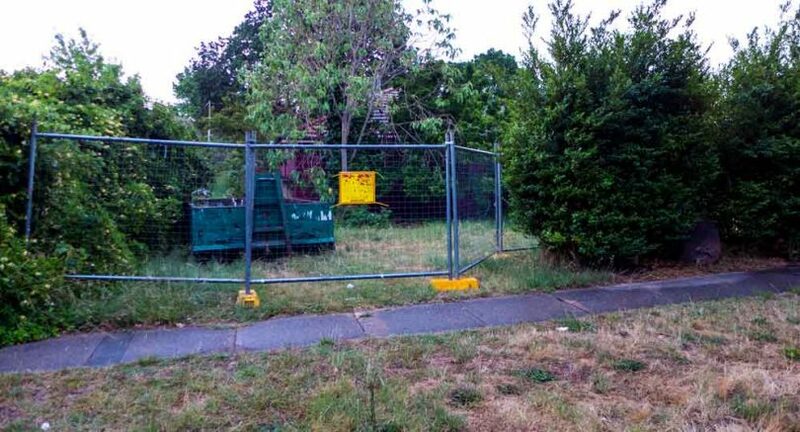 It’s possible to comment on the failings of Canberra’s planning and building/development approval processes in allowing such developments without denigrating the homes and the lives of thousands who have likely worked very hard to be able to afford a place of their own. I couldn’t get over how ugly some of the suburbs were when I last visited. Ugly, unused and graffitied buildings behind wire fences with rubbish lying about. It’s not a good look for the Nations capital. Some of the new suburbs look like slums in the making with too much concrete. Those two photographs can’t be compared. 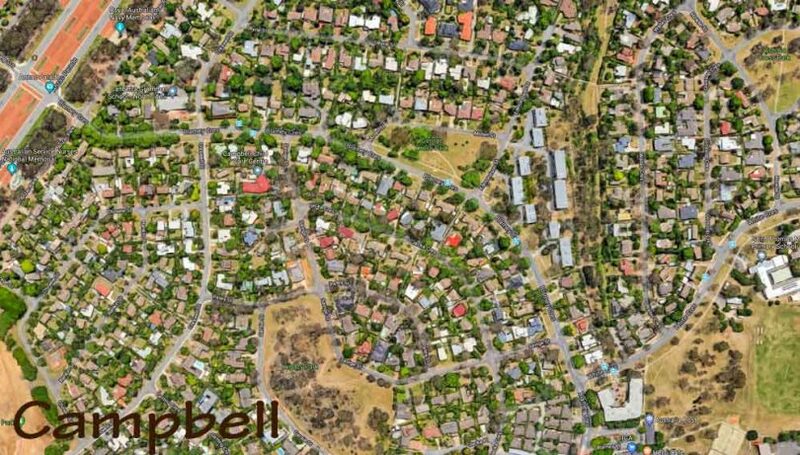 How many years has Campbell had to grow those trees compared to Gungahlin? In fact I can see tiny, new trees planted in Gungahlin. They can’t be big from day one. The old suburban sprawl can’t be allowed to go on. It is far more damaging environmentally than closer developments. What does need to improve in new developments is street layout. In newer suburbs I have had on occasions to drive 2kms to go about 50 metres. Ridiculous! Streets should be designed to lesson distance driven. This will most likely mean a grid pattern. Also, blocks need to be faced to allow maximum solar access. Also house sizes should be related to the size of block. The percentage of the block being able to be used should only increase with the very smallest blocks. Not only that the residential part of the suburb of Gungahlin was built, quite correctly too if we care for the environment to be far higher density. Go to the burbs of Gungahlin, especially the newer ones, open your eyes and mind. That’s what I did a few years back now and happily live in said suburb. Despite being a new subdivision I still have plenty of birds, a decent sized back yard (big enough for the Xmas day cricket match) plus Roos feeding over the road. I even have a wetlands 25 down the road. I think some of the issues people have with Gungahlin come from the early days where there was a cram em in mentality, and whilst that may still be true a genuine effort to incorporate open space is apparent in the newer suburbs. As to the alternative? More and more low density urban sprawl. By now If we had of contributed the 1/4 acre block mentality we would be half way to Yass ala the NCDC’s Y plan. Now that would be bad for the environment when you factor in the roads and infrastructure required to support it. Have to disagree for Wright....there are 4 parks with great plantings within 3 blocks of my house in Wright (trees are still young) but must admit that the concrete jungle along John Gorton Dr looks ugly at present but once the trees grow it will improve massively. It is a new area! Community consultation is a joke. It's all one way, the community is routinely ignored and mostly dictated to. The Gov't and planning bodies are a law unto themselves. Time for big changes, those in office should update their CVs. Absolutely agree...have had experiences with recent development application for Gov to use land zoned to be used for community facilities in Wright. Yes, need to replant the nature reserves with trees too, very barren but should be beautiful. The fires were 14 or so years ago...time to help the regeneration. The fires ripped through commercial pine plantations not nature reserves. Your not suggesting they make the mistake of putting large scale pine plantations next to residential again are you? Ashley Wright Coleman ridge, Mt Taylor and I’m sure other areas are pretty barren from the fires. I would guess that the biodiversity of Coombs and Wright is probably greater now (with houses on the land) than it was before the fires. Yeh start with Palmerville Historical Park and the memorial tree park within. It's a damn disgrace to Canberra. Totally agree. My mums street in an older North suburb is about to be subject to three lots of townhouses being built. In approving these, I can only assume the govt hadn't thought about the age of the existing infrastructure,and the pressures put in it (sewerage for example), the effects on neighbouring houses, not to mention the extra traffic in and out of the street where there are no footpaths. Sadly the face of the street/suburb is vastly changing all for the sake of $$$. Very sad and unnecessary. We were told that the priority for the ACT government was to “sell, sell, sell...to make money”. We have an old ACT govt building in Belconnen that appears to have been sold to create more shops and apartments, when there is already surplus apartment buildings going up in Belconnen, and a number of vacant shops that can’t even be leased. We are constantly told that we have community consultation, but the government only goes through the requisite motions, but in the end, pay no attention to what the community actually needs or asks for or even needs. We have a very small park opposite the Belconnen Mall that really needs to be extended with more green space, as the population swells, but all the government wants to do is sell to developers for even more shops that won’t ever be leased. The old medical centre has been trashed by kids, its become an eyesore and dangerous, as it fills with rats and possums. I say to the government “Give over this block to green space - it’s desperately needed”. 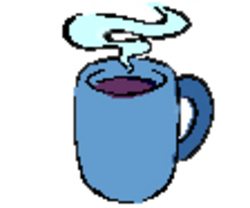 On any given day there are lots of people using it. I use it every day, and many others use it daily too, I’m sure there are even more people who would use it more frequently if there are areas specifically for children, if children’s play equipment was installed, if adult games area was set up for bowls or boules, or even adult exercise equipment was included. Perhaps even a community garden. I’m sure people will be prepared to join in to grow their own food. There are so many things that that block could be used for rather than more shops or apartments. There are plans for 6 new apartment buildings within a kilometre of each other, all 20 storey’s high. Putting up another set of shops comes with problems - parking! Absolutely agree with Paul Costigan’s concepts! Uncontrolled development does not fit with the attractions that bring people to ‘the bush capital’ to live and visit. We pay exorbitant rates would be nice if the ACT govt trimmed all the trees on the nature strips in the streets they are all overgrown !! The state of the open areas is sad, the weeds growing in the gap between the road and Comm Av bridge a couple of years ago were taller than most cars- it's become a disgrace. I agree. We have made a kookaburra nesting box and have 3 baby kookaburras delighting us this year. Destruction of old large gum trees destroys nesting holes for kookaburras and other native birds as well as available food sources being built over. Some residents in newer suburbs may never hear bird song. 100% agree. The capital of Australia is an embarrassing example of neglect. It was once a pristine, beautiful city and was often criticised for being so. Now it is just the opposite. Can't wait to move out. Apartments and units are actually all many people can afford anymore unfortunately. Also, many of the problems you describe are issues everywhere, not just Canberra.